‘… historian Kathleen Villiers-Tuthill has discovered, Nimmo supervised the erection of over 40 piers along the west coast - along with 243 miles of road and a survey of two-thirds of the highly indented coastline. And there's more. Roundstone wouldn't have existed without him, … Yet his efforts weren't immediately recognised, as she discovered, and he wasn't given adequate support. He died at work at the age of 49, when the authorities were trying to blame him - rather than weather and funding delays - for the failure of some of his roads and bridges. Villiers-Tuthill studied much of the evidence given by him to government inquiries and commissions, and concludes that he was a man of principle and ideas … The full version, along with many of Nimmo's own reports and wonderful maps, can be found in Alexander Nimmo and the Western District, by Kathleen Villiers-Tuthill’. 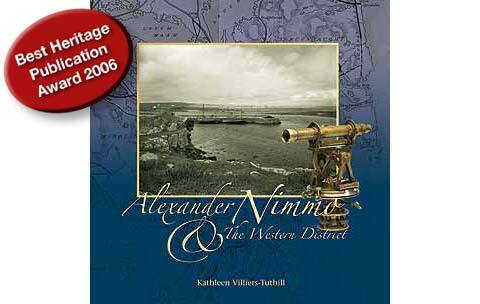 ‘… a comprehensive and readable account of the creation of Alexander Nimmo’s monumental works in the Western District from 1822 to 1832, the year he died’. Alexander Nimmo, pioneering Scottish engineer, came to Ireland in 1811 and remained in the country until his death in 1832. During this time he was employed by a number of government bodies on various key projects throughout the country: he conducted surveys for the Bog Commission in Kerry and Galway, he surveyed two-thirds of the coastline for the Fishery Board, he directed the construction of two hundred and forty-three miles of road in the Western District, and supervised the erection of over forty piers along the west coast. From 1822 and 1831, Alexander Nimmo had full responsibility for public works in the Western District. It was he who chose the site for the piers and the direction the roads were to take. The choices made by Nimmo at this time shaped the landscape we recognize today and resulted in the development of many of today’s villages and coastal communities. His choices also determined which districts were marginalized and which were developed. Nimmo’s decisions would inevitably bring him into conflict with local interests groups, landed proprietors and the Irish Administration in Dublin Castle and were a contributory factor in his eventual removal from the West in 1831. Alexander Nimmo & The Western District seeks to provide the reader with the background to Nimmo’s work in Ireland; to demonstrate the conditions under which he worked in the West, the infrastructure (or lack of it) that existed prior to his arrival, and the impact that his work had on the coastal regions in particular. The book outlines the material available to Nimmo when he embarked on his coastal survey, and the contemporary assumptions and ideas that may well have influenced his findings and recommendations. Nimmo’s remarkable reports to the Fishery Board on the coast from Sligo Bay to Galway Bay provide an invaluable picture of conditions on the West coast of Ireland at a time when relatively few travellers documented the region and are reproduced in their entirety in the appendices to this book. The book also carries Nimmo’s drawings of his piers, several maps of his roads, along with early maps of the five counties that made up the Western District. Charts of individual bays and sections of the coast are also reproduced from his chart of the Irish coast, first published in 1832.